My virtual homework calendar updated daily on Google Calendar so parents and students can be informed about all assignments. 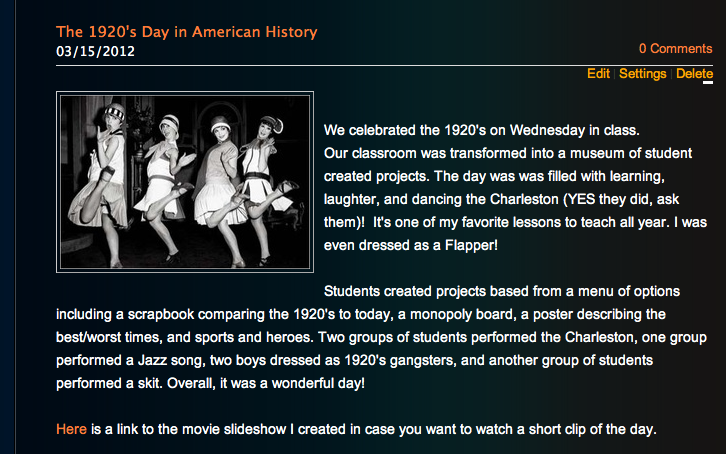 This is part of my classroom blog where I keep families up to date on events and news. Parents have commented that they feel like they truly know what is going on in school. My hope is that it can always maintain the vital home and school connection. I have found Quizlet virtual flashcards to be an extraordinary study tool for students regardless of course level. Students in every class I have taught have benefited from the wonderful features Quizlet has to offer. A major benefit of studying with flash cards is that they appeal to both visual and non-visual learners. Using online flash cards has many advantages such as easy tracking of answers, fast modifications to the cards, attractive appearance, and studying can become a fun game. At the beginning of every school year I write a letter to my students introducing myself and welcoming them to my classroom. For homework, I then ask them to write a letter back to me. Through their correspondence I am able to learn their names and interests, and it establishes a positive connection in my classroom.